Once a second workout was lined up days before the draft, perhaps the desire to add him to the group should have been obvious. But in the shocker of the night, the Sixers traded the rights to hometown kid Mikal Bridges in order to bring Zhaire Smith into the fold, in a move that will be debated for quite some time. Before we get to the players involved, the value of this deal is important. According to ESPN's Adrian Wojnarowksi, Bridges is headed to Phoenix in exchange for the draft rights to Smith and a valuable future selection. The Sixers clearly liked both players a great deal, but the pick they acquired in the transaction is a pick originally owed to Phoenix by Miami as part of the Goran Dragic trade. That pick, which conveys in 2021, was completely unprotected when sent to Phoenix. It's not clear yet whether the Suns have added any protections to the pick, as the Sixers did in order to hold onto the Lakers pick in the Markelle Fultz trade, but this Miami pick is a serious trade chip moving forward in almost any scenario. With Kawhi Leonard on the market, several important pieces fall into place for Philadelphia as a result of this move. First, the Sixers pick up another chip to send San Antonio's way in the event they want to make a deal. On top of that as a bonus, they will save almost $1 million in cap space in the difference between the slotted salaries from 10-16. For a team looking for ways to clear as much space as they can in order to bring in big-name players, this is a small but important detail. I had serious doubts about a front office being led by a head coach to focus on the long-term. The value recouped in this deal sort of nukes that belief. That goes double when you consider this: 2021 is the year when the one-and-done rule might evaporate, which could end up inflating the value of the asset as more talented players flood the draft pipeline. Moving on to the guy we believe will be the newest Sixers player, let's start with the positive. Smith is almost definitely going to make an impact defensively at the NBA level, even if the degree to which he will do so has been overstated by his biggest proponents. Smith quickly morphed into a do-it-all defensive player for the Red Raiders, credibly defending players at every spot on the floor. Some of his underlying traits suggest he will continue to impact the game as a defender when the bar is raised at the next level — he closes hard on shooters, is not deterred by opponent screens, and isn't the sort of player who shies from contact. And if you listen to him talk, Smith seems hyperaware that being a difference maker on defense will be part of his path to NBA relevance. Speaking to reporters following last week's workout in Camden, Smith insisted that was his calling card as a player. "Defending [is my go-to]," said Smith. "I feel like anybody can score, and if you just do that small thing that coach wants you too, you can do [well] in the league." His instincts and activity on the defensive end made him a tremendous disrupter at the NCAA level. He averaged 1.6 steals and 1.6 blocks per 40 at Tech, and some of the latter were of the same highlight variety as his putback dunks. Smith has a great feel (and the requisite athleticism) for pulling off chase down blocks, which are a nice cherry on top of his defensive package. One problem with getting too giddy about his defensive potential: Smith had a significant athletic advantage over his competition in almost every game he played at Tech, and his size was more than adequate to handle switches against college competition. That's going to change in a hurry. Wingspan can only make up so much of the difference — the NBA is an army of 6'7"+ wings these days, and in playoff matchups in particular, teams will hunt switches until they get size or speed mismatches they want. Having the proper compete level will aid him in these situations — he's not just going to concede the basket or refuse to fight through a screen — but there's a logical limit to which that makes a difference if you're outgunned. If you assume that his defensive versatility will be dampened at the next level, that takes a decent amount of luster off of his case as an impact player. Now the real problem: Smith is a very raw product on the offensive end of the floor, and has more of a power forward's game on that end of the floor than anything else. Shooting and the dribble-drive game are the areas to hone in on if you're trying to determine Smith's fit on the Sixers. He knocked down 45 percent of his threes in his lone collegiate season, but that figure came on just 40 attempts, which isn't enough to be trusted whatsoever. Had he been a very good or elite free-throw shooter, there'd be reason to believe in the shot translating, but his 71.7 percent mark from the charity stripe is not enough to make that argument. From what we have seen from him as a shooter, he's also fighting uphill on the mechanical front. Smith sports a fairly slow release, and he had a tendency to miss some of his jumpers badly, rather than just too long or too short. Being a non-shooter is basically not an option for other guards on the Sixers' roster, as the ramifications of building around a player like Simmons are felt all over the court. Then there's the question of whether he is actually capable of creating with the ball in his hands at an adequate enough level to score and create for others. Smith was in a low-usage role for a first-round pick, particularly for a guard, and to believe in him at the next level you have to believe this is a function of his role and surrounding talent more than it is about Smith. The good news? Smith is an outlier athlete, and his on-court IQ is tremendous. 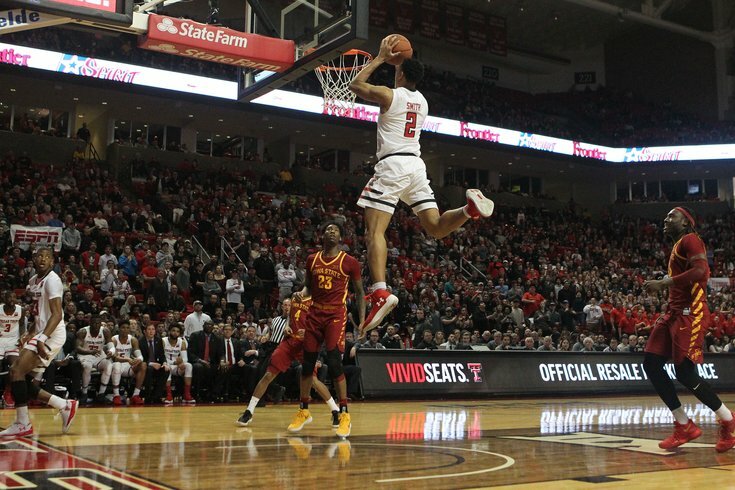 Chances are if you've seen Zhaire Smith play at all over the past year, you have seen him throw down a gnarly dunk. He has crazy explosion off of either one or two feet, and more importantly, he uses it well. Athleticism is only useful provided it is functional, and Smith is excellent at identifying plays where he can leverage his athleticism into impact plays. Smith's progression from three-star recruit to lottery target suggests it's not out of the question for him to continue adding elements to his game, and if he ever rounds the jumper and handle into shape, there's a potential star within him. But that doesn't seem like an especially likely outcome, and there's a much more likely outcome where Smith never shoots well or handles well and you're left with a bench player/energy guy you can find much deeper in the draft. This is a pretty healthy-sized risk for the Sixers, and it comes at the expense of a local kid who people were excited to have in a Sixers uniform. There are going to be plenty of sports talk programs built around this series of moves. That said, it's the sort of risk that's encouraging to see them make. Rather than opting for an older, surefire thing that would slot right into the lineup, the Sixers are betting on their development program to get Smith to the next level. Time will tell if it was a worthwhile gamble.